Sacramento Valley Chorus is participating in the 2019 Sacramento Region Community Foundation Big Day of Giving. The Big Day of Giving provides a platform for eligible non profit organizations in the Sacramento area to receive donations from interested donors on a designated date. To learn more you can visit the Big Day of Giving website: www.bigdayofgiving.org. At Sacramento Valley Chorus we strive to “harmonize the world” by providing an opportunity to our members to learn and perform four part acapella barbershop harmony; and an opportunity to our audiences to experience this uniquely American art form. This year, in addition to our local performances, we will be performing in competitions in Sparks, Nevada, and in New Orleans, Louisiana. With your support during Big Day of Giving on May 2, we can grow our impact in this community and beyond. Sacramento Valley Chorus is a 501(c)(3) non profit organization. Our Tax Identification Number is 94-2617400. Donations are fully tax deductible. The minimum donation is $15 and all donations will help our cause. You can schedule your donation in advance starting on April 15. 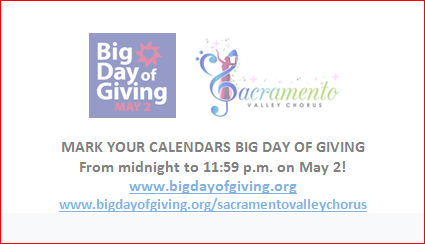 To make a donation, visit www.bigdayofgiving.org and enter Sacramento Valley Chorus in the “Find Your Cause” text block. Of course, if you prefer to donate by check you may mail a check to our Big Day of Giving team lead: Sarah Eary, 2721 Zane Drive, Woodland, CA 95776. Are you interested in being a matching fund donor? Matching fund donations encourage additional donors because the amount attributed to matched donors is doubled until the total matching funds have been depleted. Matching funds really do have a significant impact on potential donors. If you are willing to be a matching fund donor, please contact Sarah Eary at 925-212-5061.